I wondered when I got a call at 3 AM from one of my friend, Jack. Tell me what can you expect when you got a call in the very early morning? Yes, it is very odd time to get a call and I also thought the same just like you that, there may be an emergency. But, I was shocked after picking the call. Why was I shocked? Just read the call conversation. Jack: Yes, Badam Satti. The most entertaining app I ever played. When I got up in the morning and the same thing was running in my mind. What is Badam Satti? Why Jack was crazy for Badam Satti? I turned on my laptop and search about Badam Satti. That is the first thing I did that morning. I clicked on the first link and it landed on the Badam Satti app in Google Play Store. I read the full information of Badam Satti that Badam Satti is an entertaining Indian card game mobile app. It is developed by the best mobile app development company CDN Software Solutions Pvt Ltd. and it is originated from Russian card game “Durak”. Finally, Badam Satti is a mobile version of popular Indian card game “Satti Center”. 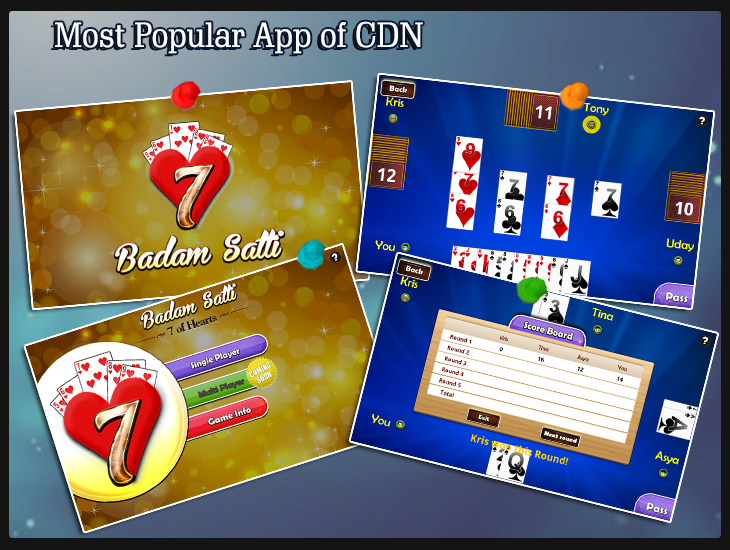 Badam Satti is also listed on CDN App Center, a free mobile app store. Badam Satti is available for both single player (for iOS and Android) and multiplayer (only for iOS). Badam Satti starts with that player, having 7 of hearts. The next player can play with either 6 of hearts or 8 of hearts or 7 of any other suit like Spade, Diamond or Club. If the player does not have any of these cards, he can pass the turn. You can share your score with your friends through social media sites like Facebook and Twitter. The aim of the game is to finish the one’s cards before the opponents does. The winner is the one with least card points. Badam Satti really refreshes the player’s mind. It is surely a great exercise of mind. You can download Badam Satti for Android from Google Play Store and Badam Satti for iPhone from iTunes Store. I could not resist myself after getting full information about the most entertaining mobile app. I downloaded it and send request to play Badam Satti to Jack. After playing Badam Satti I understood that why Badam Satti is a good and entertaining app? It was the great start of the day. I also invite you to play Badam Satti. Why Social Media Apps Are Trending? Where You Can Find Best Mobile Apps?